Sacred Heart senior Jenna Chadek is a living message to all who come in contact with her. During her sophomore season, symptoms of a rapid heartbeat led her and her family to see multiple specialists to determine the underlying issue. It turned out to be three issues. Last year as a junior, Chadek not only played, she played well, averaging 14 points per game and shooting more than 35 percent from the 3-point line. This year, as the only senior on the team, she’s leading a scrappy Sacred Heart squad intent on finishing the year with a winning record, which would be an improvement from last year’s 12-23 finish. 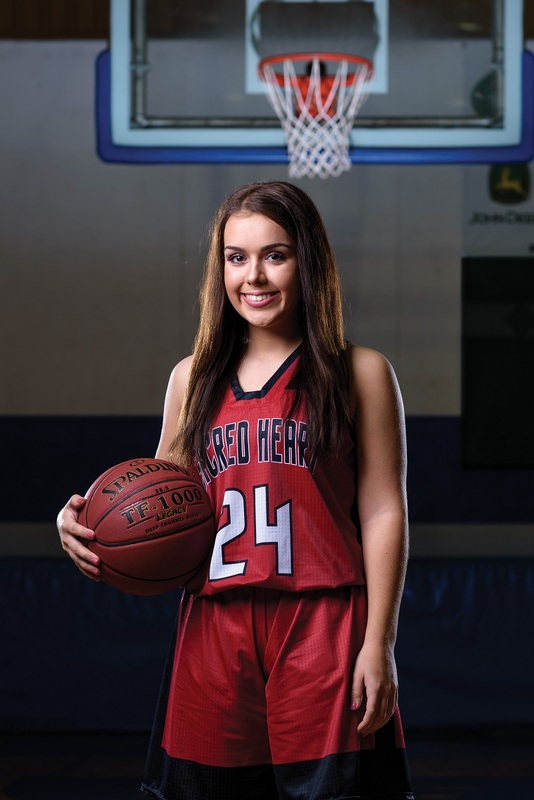 Chadek, a senior guard for Sacred Heart, was selected to this year’s 501 Basketball Team — 34 players representing the best the 501 has to offer both on and off the court. The team is sponsored by Conway Ortho and Sports Medicine Center, Conway Regional Health System and First Security Bank. Chadek was nominated by her head coach, Kyle Duvall. “One of the best qualities for Jenna on the court is her ability to shoot the ball,” Duvall wrote in his nomination. “Anytime we needed a big shot [last season], Jenna was called upon, and she is comfortable shooting the ball anywhere on the floor. She has improved her game this off-season by attacking the rim more and becoming a better overall offensive player. Jenna is a great teammate. She is someone who brings a lot of energy and encouragement on a daily basis. As of press time, Chadek and Sacred Heart sit at 14-14 with two games remaining — Nemo Vista and Shirley. “I always look forward to playing Nemo,” Chadek said. “Everyone knows each other. It has a fun vibe, but also a serious vibe at the same time. I think the biggest thing is we have to be solid on the defensive side. They have girls who can score the basketball in crafty ways. Our offense feeds off of how much energy we put out on the defensive side. We are more than capable of scoring enough on the offensive side, but being energetic on the defensive side will be what wins us these two games. Chadek also participates in golf and softball at Sacred Heart. She serves as president of the Key Club, which focuses on serving the community through various projects. After high school, Chadek plans to earn a bachelor’s degree in health sciences and work as a cardiac sonographer. Chadek and Sacred Heart play host to Nemo Vista at 6 p.m. Friday.